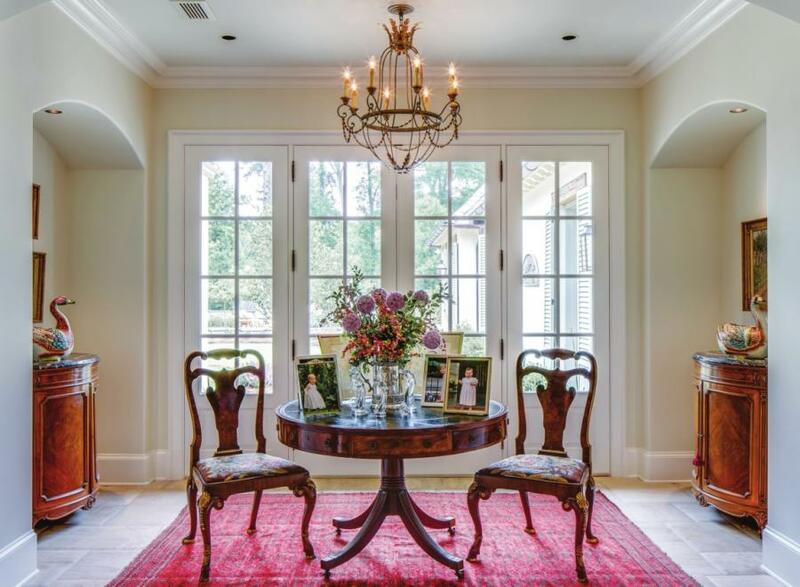 It’s a home that is easily recognizable by those who have driven through Shreveport’s Pierremont neighborhood. The grand pergola above the front patio and the custom gates flanked by turret columns are quite distinct. The custom home, located on Gilbert Drive, took a couple of years to complete, according to builder Jonathan Hamilton of Hamilton Builders. 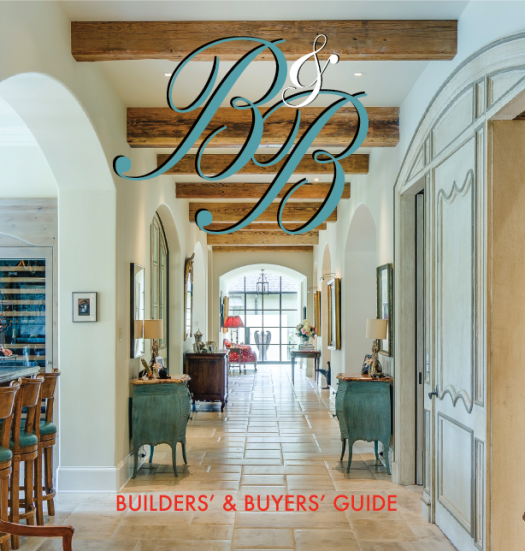 He says the style of the home is European Cottage and was designed by architect Jack Arnold of Tulsa, Okla. – one of the country’s leading architects of French Country style homes. Passing through the gates at the front of the property, a circular driveway leading to a square parking area with inlaid brick and a copper water feature presents itself. 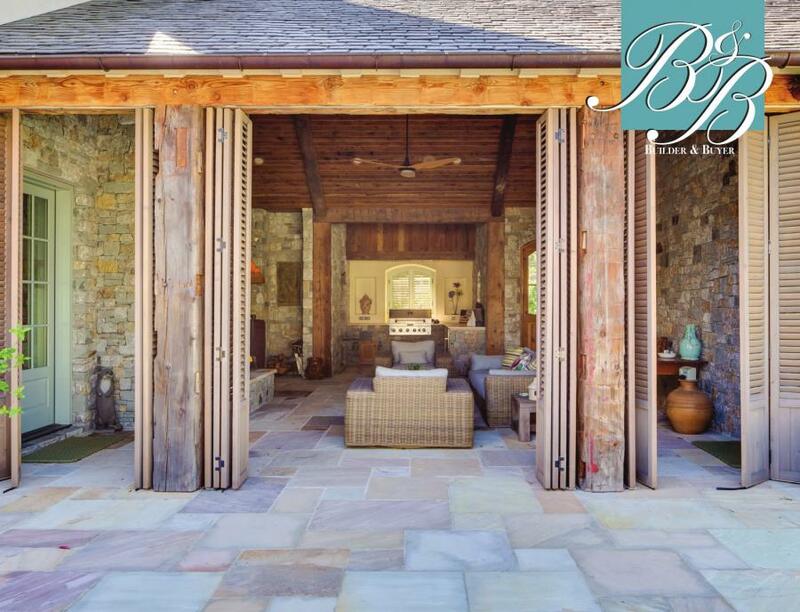 A Pennsylvania bluestone walkway and patio are topped with a pergola. The pergola adds a unique element to the face of the home. Hamilton says it has steel bases and the wood is morticed down into the steel. "The reason we did that is because the architect said the bottom of pergolas always rots out. So, the wood posts go partially down in [the steel] and are bolted in. The bottom ten inches is just steel,” said Hamilton. The arched entryway on the opposite side is limestone quarried in France. Hamilton had it shipped over, and it was put together on site. The door is an antique that came from an antique dealer in Dallas, and the gas lanterns are from Bevolo Gas & Electric Lights in New Orleans. The front entry leads into a foyer. French antique pillowed limestone floors laid in a Versailles pattern line the long gallery. Hamilton says the limestone is specially quarried, ”You order it and they quarry it in France and mill it per your specifications,” he said. The gallery stretches from one end of the home to the other. Steel and glass doors are at each end, and antique timbers run the length of the ceiling. 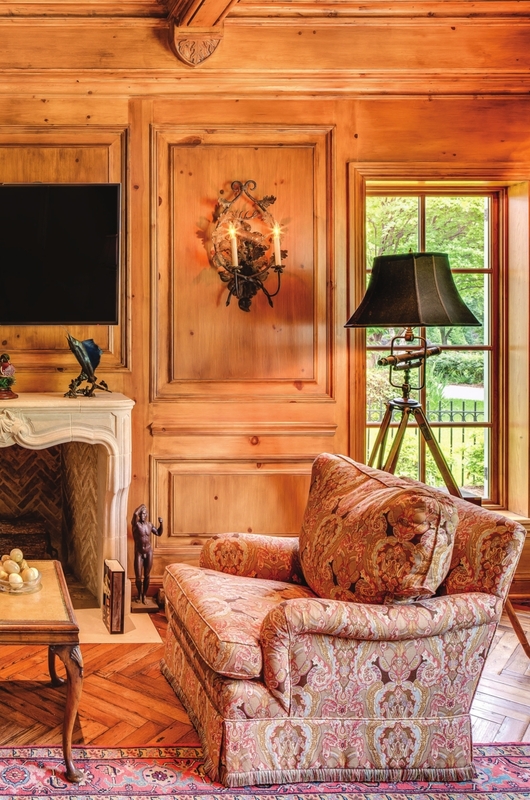 The living room's two built-ins were crafted by local carpenter David Hollingsworth. They were hand-carved and a custom finish added on site. 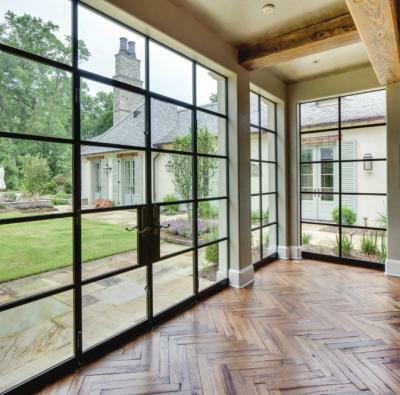 A 12- foot steel window overlooks the lush landscaping of the front of the home. The ceiling is antique cypress with a light wash, while the timbers are waxed antique pine. Hamilton said he sources his antique lumber from Custom-Bilt Cabinet & Supply of Shreveport. “Carl Bretz, one of the owners of Custom-Bilt ... has different sources. He will buy old barns in Canada and the Carolinas and south Louisiana ... and then ship them up here,” he said. “We bring them out to the job - and they’re all nasty and dirty - and we clean them up, take the old paint off of them, all the bolts.” The 200-year old limestone mantle is an antique reclaimed from France. It was purchased from an antiques dealer in Houston. The mantle was shipped in pieces, and Hamilton Builders put it together and retrofit it to work for the house. The firebricks are also reclaimed from an old house in France. Heavy wood and glass pocket doors were built for the dining room. The walls are Venetian Plaster with a medium polish. There are antique pine timbers and a speckled gold wallpaper on the ceiling. Contemporary steel windows, with doors leading into the backyard, encompass the back wall. The remaining walls in the home are smooth with a bullnose edge. The rounded corners soften the home and add a finished look to the trimless doorways. “One thing that we did in this house – and every house that we build – we have what we call a level 5 finish on the walls. It’s very slick. Most houses have the orange peel texture on the walls,” said Hamilton. The bar area has poured pewter countertops with a rope detail edge. The cabinetry is made of Knotty Alder wood. Some of the cabinet fronts are chicken wire. Back in the gallery, an elevator is hidden behind a clever set of large, sliding doors. A butler’s pantry on one side of the elevator and stairs on the other can be closed off to disguise the elevator’s location. The butler’s pantry has a built-in refrigerator, sink, oven, and microwave and a small storage cabinet for china, glassware, and serving pieces. The kitchen has 3-centimeter thick marble countertops with a laminated mitered edge made to look like a 3-inch piece of marble. The white oak cabinets are Bentwood and came from a supplier in Dallas. 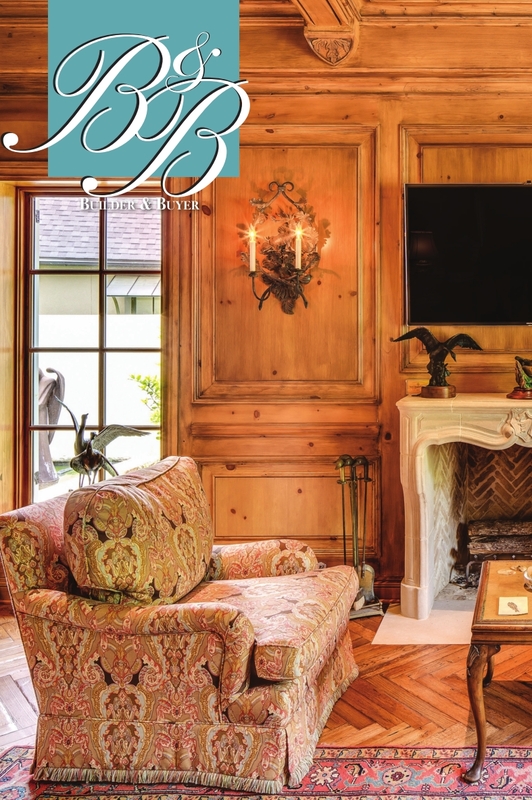 Warm antique cypress adorns the ceiling, while the beams are reclaimed pine. The Wolf appliances and Sub-Zero refrigerator came from the Kitchen & Bath Cottage. The industrial vent hood was crafted locally and is made from zinc with copper strapping. Over in the hearth room, the floors are hand scraped pillowed antique planks. A limestone mantle and more antique pine beams complete the room. Hamilton said a lot of work was invested in the study and its hand-carved wood panel walls. A custom limestone mantel is mounted flush with the firebricks inside. Another window overlooks the award-winning landscape design created by Cadence of Ft. Lauderdale, Fl. 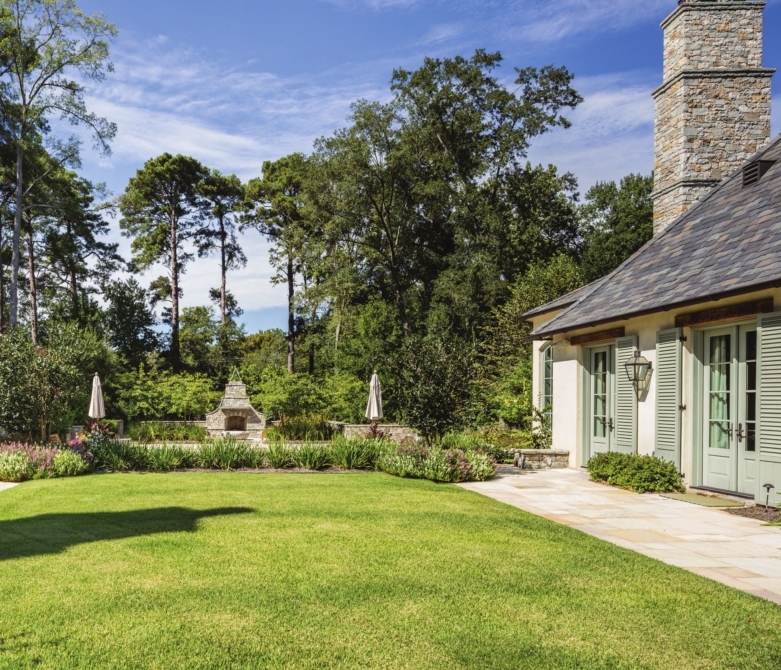 It melds French country garden design with classic Louisiana garden design details. Cadence developed all the hardscape and exterior wall and gate elements. A hallway off of the gallery leads to the master suite and can be closed off. The en-suite bath has a pink marble tub surround and a walk-through shower that connects his and hers dressing and closet areas. The “his” side is masculine with many built-in elements – shoe racks, a tie rack, and even a pull-out along with bookshelves. The “her” side is very feminine with pink floral wallpaper, plenty of space for clothing and accessories, and houses a stacked washer and dryer. The bedroom itself has vaulted ceilings with intricate beam work. The fireplace mantel came from their previous home. Off of the bedroom lies a reading retreat. It is a round windowwalled reading room overlooking the backyard and swimming pool. The flooring is reclaimed Jerusalem stone. Antique beams adorn the cypress ceiling and are also inlaid into the stone walls. The hardware on the doors is Ashley Norton Hardware. The ceiling in the outdoor living area/kitchen is a dirty-top reclaimed pine, and the beams are hand-hewn. “You can shelf to set a suitcase on when packing, see the hatchet marks in them because they date before sawmills," said Hamilton. "They were chopping them out of an old log.” The wood came from an old barn in Canada. 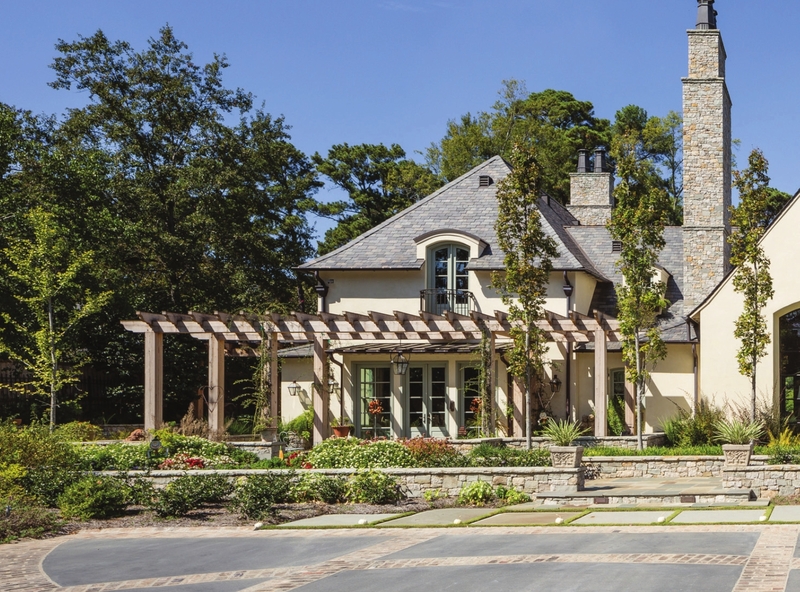 The stone in this area is limestone quarried in Oklahoma and laid in a dry stack style to create an appearance more like an old French house. There are limestone countertops in the outdoor kitchen, and the hood is custom built. “We used an old handhewn beam, put a vent up in there, and used antique wood on the face,” said Hamilton. Louvered doors – designed for winter – can be closed to make the space more like an indoor room. The stonework in the backyard is sandstone quarried in South America. There is also a pool by Waterscape Pools with an automatic cover, an outdoor sitting area with a fireplace, and an arbor built from cedar timbers with a copper roof. The home has four fireplaces and the chimneys are topped with copper pots from European Copper. There is a cupola on top of the garage and decorative louvered vents in the roof. The kitchen is a stunner by any measure. 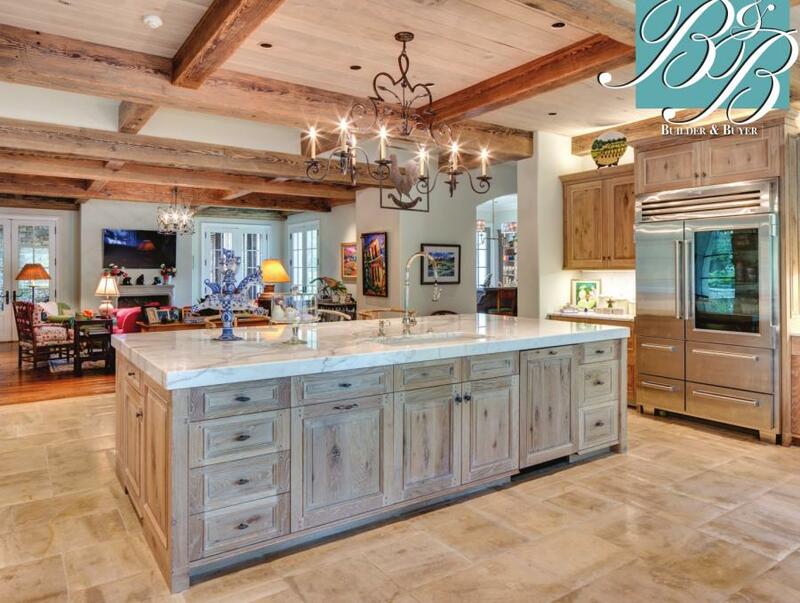 A double-size island with a marble top, hand-crafted woods and top-of-the-line appliances make it a dream. The open-concept area overlooks the den and back gardens. A sitting area is warmed with wall niches featuring demi lune consoles on either side. The sweeping exterior of the home on Gilbert Ave. is a definite showstopper. 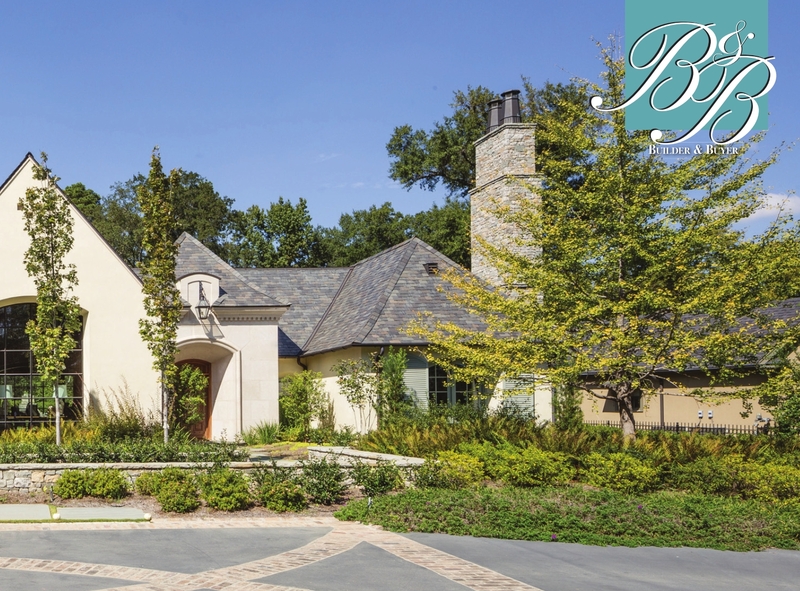 Its linear design is an outstanding example of its architectural type in the established South Highlands neighborhood. In the richly paneled den, wildlife art and sculptures are prominent among classic elements such as the marble fireplace, matching torchieres and twin sofas. Outdoor living space includes an outdoor kitchen and louvered shutters that can enclose the area for privacy or inclement weather. 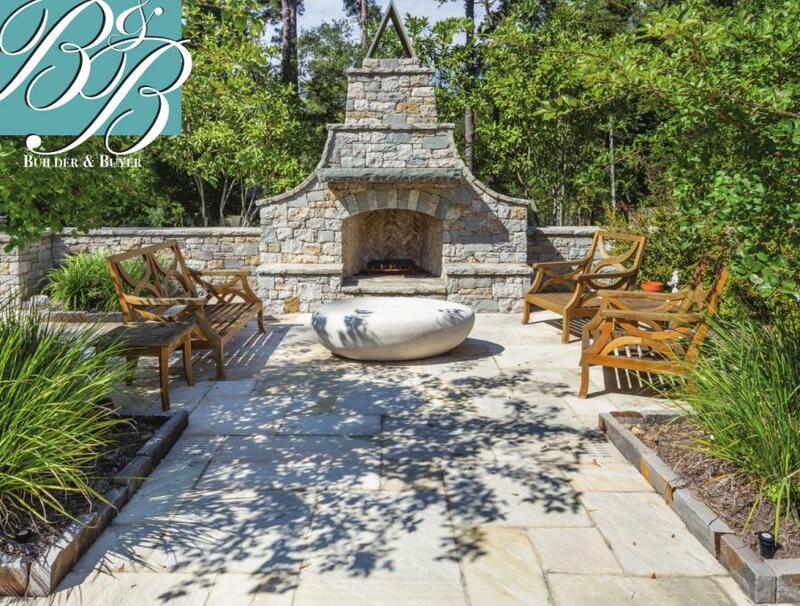 This outdoor oasis has a rock fireplace surrounded by a low stone wall. The inner courtyard is enclosed in an envelope of privacy. A romantic backdrop of pine trees lends an air of mystery to the focal point.